Frontpage Interview's guest today is William Kilpatrick, the author of several books, including Psychological Seduction and Why Johnny Can't Tell Right from Wrong. His articles about Islam have appeared in FrontPage Magazine, Investor's Business Daily, Catholic World Report, and other publications. 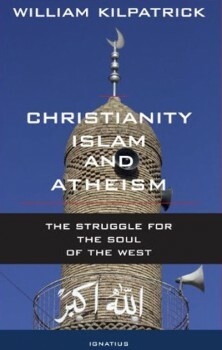 His most recent book, Christianity, Islam, and Atheism: The Struggle for the Soul of the West explores the threat that Islam poses to Christianity and Western civilization. The book also examines the role played by militant secularists in facilitating the expansion of Islam. FP: William Kilpatrick, welcome to Frontpage Interview. Let's begin with you telling us what inspired you to write this book. Kilpatrick: In a way it's a continuation of an earlier book of mine, Why Johnny Can't Tell Right From Wrong. That book looked at the ways in which moral relativism impaired Johnny's ability to tell right from wrong. Part of the new book looks at the ways in which cultural relativism, or multiculturalism, impairs his ability to tell friend from foe. One of the chapters is titled "Why Johnny Can't Read the Writing on the Wall." One of the main reasons Western citizens can't see the obvious about Islam is that they have been subjected to an educational system that insists on the moral equivalency of all cultures and religions, just as it had previously insisted on the equivalency of all value systems. So, the initial impulse for writing the book was my realization that the same people who introduced moral chaos into schools and society were now bent on normalizing an alien ideology. Or, to paraphrase Mark Steyn, the people who brought you Heather Has Two Mommies are about to bring you "Heather has four mommies and a great big bearded daddy." FP: Can you explain the title? Kilpatrick: I use the word "atheism" in the title as shorthand for both atheists and militant secularists, most of whom tend to be on the left. Many Christians have awakened to the fact that they are in a cultural struggle with secular leftists, but far fewer have come to the realization that they are also in a civilizational struggle with Islam. Fewer, still, are aware that, as you point out in United in Hate, the left has formed a tacit alliance with radical Islam against the West. Of course, Christians aren't the only ones who are threatened by Islamic expansion. All non-Muslims are. But in the West, Christianity has traditionally been the focal point of resistance to Islamization. Unfortunately, Christianity in the West has been weakened both by secular attacks and by self-inflicted wounds. As a result, Christians in the West are failing to stand up for their cultural heritage. In fact, many fail to realize that their culture is under attack. But without Christianity you are left mainly with philosophies of relativism, skepticism and materialism—philosophies that have proved themselves incapable of resisting Islamization and, in fact, serve to enable its spread. You can see this most clearly in Europe where the decline of Christianity has been accompanied not only by the rise of secularism but also by the rise of Islam. With the loss of faith has come a loss of meaning and the loss of a sense among Europeans that they have anything worth defending. The loss of faith is also one of the main factors accounting for Europe's population loss. In other words, the decline of Christian faith in Europe created a spiritual vacuum and a population vacuum, both of which Islam was quick to fill. While Muslim leaders and radical secularists are fully engaged in the struggle for the soul of the West, many Christians seem unaware that they are under attack from two sides. They need to wake up before it's too late. FP: In one of your chapters, you spoke of "Christian enablers of Islam." Can you elaborate on that? Kilpatrick: Many Christian leaders unwittingly act as enablers of Islam's totalitarian agenda by focusing on the surface similarities between Christianity and Islam rather than on the profound and irreconcilable differences. A prime example is the Vatican II document Nostra Aetate which includes a short statement of the Church's relation to Muslims. Essentially, it says that Muslims adore the one God, revere Jesus, honor Mary, and value the moral life. Reading it one could easily jump to the conclusion that the Christian faith and the Islamic faith are very much alike. One might also conclude that Islam is indeed a religion of peace that has been hijacked by a handful of terrorists who misunderstand their own religion. However, before jumping to that conclusion one needs to realize that Nostra Aetate was never intended to be the last word on Islam. Rather, the stated purpose of the declaration was to consider "what men have in common." Moreover, it was written at a time—the 1960's—when the Muslim world was far more moderate than it is now—a time when interreligious dialogue seemed to hold great promise. Recently Pope Benedict noted that with the passage of time "a weakness" of Nostra Aetate has become apparent: "it speaks of religion solely in a positive way and it disregards the sick and distorted forms of religion." I think it safe to say that he's referring here to Islam or, at least, to some forms of Islam. This is a hopeful sign of a new realism about Islam. For too long, Catholic and Protestant leaders, alike, have been content to fall back on what I call the "common ground thesis"—the comforting belief that the Christian faith and the Islamic faith share much in common. As a result, a lot of Christians have been lulled into complacency about the threat from Islam. If they want to avoid the fate of Christians in North Africa, the Middle East, and various other Muslim regions they need to get a better grasp on what Islam really teaches. FP: What do Christians need to understand about the differences between Islam and Christianity? Kilpatrick: Islam is built on a rejection of the main tenets of Christianity. It rejects the Trinity, the Incarnation, the Crucifixion and the Resurrection. There is a Jesus in the Koran but he seems to be there mainly for the purpose of denying the claims of Jesus of Nazareth. Muhammad seemed to have realized that if the Christian claim about Jesus was true, then there would be no need for a new prophet and a new revelation. Consequently, in order to buttress his own claim to prophethood it was necessary for him to cut Jesus down to size. Thus the Koran tells us that "he was but a mortal" and only one in a long line of prophets culminating in Muhammad. John the Baptist said of Jesus that "He must increase but I must decrease." Muhammad preferred it the other way around. For him to increase it was necessary for Jesus to decrease. Christians need to realize that Jesus is in the Koran, not because Muhammad thought highly of him but because Muhammad saw him as a rival who needed to be put in his place. The problem is that in using Jesus for his own purposes, Muhammad neglected to give him any personality. The Jesus of the Koran is more like a stick figure than a person. Whether or not one accepts the claims of the Jesus of the Gospels, he is, at least, a recognizable human being who goes fishing with his disciples, attends wedding feasts and gathers children about him. By contrast, the Jesus of the Koran seems to exist neither in time nor space. The Koranic account of him is completely lacking in historical or geographical detail. There is no indication of when he lived, or where he conducted his ministry, or the names of his disciples or his antagonists such as Herod and Pilate. In other words, he seems to be nothing more than an invention of Muhammad's—and not a very convincing invention at that. In this regard it's instructive to note that the Koran rails constantly against those who claim that "he [Muhammad] invented it himself." In sum, Christians who think that Muslims revere the same Jesus as they do need to better acquaint themselves with the Koran. FP: Why do you think there is so much ignorance in the West about Islam? Kilpatrick: Much of the ignorance can be explained in terms of multicultural dogma combined with self-censorship. In the West the multicultural ideology has attained the status of a religion. Christians believe that Jesus saves, but multiculturalists believe that diversity saves. And to question the dogmas of diversity is tantamount to heresy. Nowadays heretics aren't burnt at the stake, but they are threatened with loss of reputation and loss of employment, and sometimes, as in the cases of Geert Wilders and Elizabeth Sabaditsch-Wolff, they are hauled before courts. As a result, people learn to engage in self-censorship or what Orwell called "crimestop." They won't allow themselves to think certain thoughts or to explore certain avenues of inquiry. This is particularly true in regard to Islam. By now, just about everyone understands which thoughts about Islam are permissible and which are not. As Andrew McCarthy points out, this results in a kind of "willful blindness" toward Islam. Like the people in The Emperor's New Clothes we deny the evidence of our own eyes when it conflicts with the official narrative. In short, we prefer to remain ignorant. In addition, elites in government, media, and education actively cover up for Islam. The media doesn't report even a hundredth of the negative stories about Islam and it does its best to deny any linkage between Islam and terrorism. At the same time the media does everything it can to normalize Islam and make it seem as American as apple pie. For example, a recent Huffington Post article likens Muhammad to George Washington. The schools are engaged in a similar kind of whitewashing. High school and college textbooks routinely define jihad as an "interior spiritual struggle" and describe Muslim conquests in the 7th and 8th centuries simply as "Muslim expansion." Moreover, many of these texts have a distinct bias against the West and in favor of Islam. For example, while the Atlantic slave trade is described at length and in gruesome detail, the Arab slave trade which lasted longer and resulted in more deaths is rarely mentioned. So, insofar as our children are learning anything about Islam, they are learning a Disneyfied version of it. FP: What must we do to save our civilization? Kilpatrick: We need to realize that we are in a high-stakes struggle similar in nature to the Cold War with Soviet-bloc communism. In this new cold war, our aim should go beyond simply resisting jihad. Our aim should be the defeat of Islam as an idea, because it's an idea that we are fighting. The driving force behind Islamic aggression is Islamic theology, and if we want to be free of Islamic aggression, we need to discredit Islam as a total system. I disagree with the notion that the religious part of Islam can be separated from the political part. Although individual Muslims might be able to achieve that separation in their personal lives, in the Islamic faith the religious and the political are inextricably bound together. So our overall aim should be to cast doubts in the minds of Muslims about the words and example of Muhammad. In other words, we should want Muslims to lose faith in Islam just as Soviet-era communists lost faith in communism. Of course, that seems a tall order. It might be objected that Islamic beliefs are too deeply rooted to ever change. But "deeply rooted" beliefs are not always as deeply rooted as they seem. Forty years ago, the Catholic faith seemed deeply rooted in Ireland—but not so much today. More to the point, the deeply held beliefs of millions of Muslims began to erode under the regimes of secular strongmen in the Middle East and North Africa during the twentieth century. As Ali A. Allawi, a former Iraqi cabinet minister, observes, "It appeared to be only a matter of time before Islam would lose whatever hold it still had on the Muslim world." The recent reemergence of supremacist Islam is largely a reaction to that loss of faith. We should do what we can to reawaken those doubts. The other thing to keep in mind is that theologically and intellectually, Islam is a house of cards. It simply can't stand up to the tests of critical reason and historical evidence that we apply to the Judeo-Christian revelation—which is precisely why we should apply them to an examination of Islam. Instead of engaging in non-challenging, non-offensive dialogue—a type of dialogue that only serves to legitimize Islam—Christian leaders ought instead to be challenging and questioning the tenets of Islam, particularly in view of the fact that Islam is built in part on a rejection of Christianity. Christian leaders can't afford to delay taking a harder look at Islam because the Organization of the Islamic Cooperation is rapidly moving ahead with its project of imposing anti-blasphemy laws on the West—laws that are intended to prevent just such legitimate criticism. FP: William Kilpatrick, thank you for joining Frontpage Interview.